3 What Is A Direct Vent Gas Fireplace Insert? 3.1 How Does A Direct Vent Gas Fireplace Work? 4.1 How Efficient are Gas Fireplaces? Using the best gas fireplace can change your life. The olden days when you spent hour after hour splitting wood is gone. Why waste time outside cutting the pieces of wood to size, when you can enjoy a glass of wine in front of a cozy fire instead? Gas fireplace inserts are easy to install and use, and they cost a fraction of the price of a wooden model. These inserts will not only look as good as a fireplace that uses wood as fuel, but they are also more efficient. Wooden fireplaces have efficiency ratings of up to 70%, whereas some gas models can reach efficiencies of up to 99%, using less fuel to produce more heat. 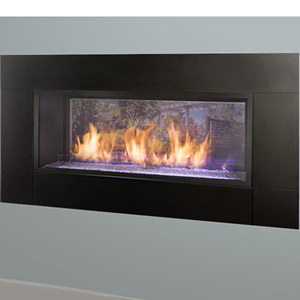 In the following article, we present the top-rated gas fireplace insert reviews. After that, we explain why some features make a fireplace insert the perfect addition to your home, and why you should consider installing one. DIMENSIONS : 25.2 x 13.2 x 32.2"
DIMENSIONS : 39 x 15 x 3"
DIMENSIONS : 31.9 x 14.4 x 28.3"
DIMENSIONS : 30 x 30 x 24.2"
DIMENSIONS : 16.3 x 36 x 34.4"
DIMENSIONS : 43 x 14.87 x 32"
The Comfort Glow fireplace is a great model for those who are looking for a vent-free unit that comes at a good price. This model has a heavy-duty construction, and its neutral design makes it a good fit for both modern and classical-designed living rooms. One of the things we liked about this model is that it comes with a built-in thermostat. This will give you the opportunity to maintain a constant temperature in the room, but it will also lower the fireplace’s consumption. The fireplace has a heat capacity of up to 30,000 BTU, so it will warm up large spaces without any problems. The fireplace’s large charred log is realistic, and the flames’ dance is relaxing but not repetitive. Easy To Assemble – This model is easy to assemble and install. Most handy people will have it up and running in less than one hour. Thermostat – This fireplace comes with a thermostat, so it can maintain a regular temperature in the room. Scratches – Some customers reported that their products were damaged at arrival. If this happens, contact the manufacturer’s customer service. The Napoleon Grandville is a great fireplace for those who are looking for a model that looks great and can heat up a large space at the same time. This model has a heating capacity of up to 30,000 BTU, so it can warm up a very large space. One of the things we liked about this model is that it’s very safe to use. The fireplace comes with an oxygen depletion sensor that will automatically turn the unit off before the oxygen levels reach a dangerous level. 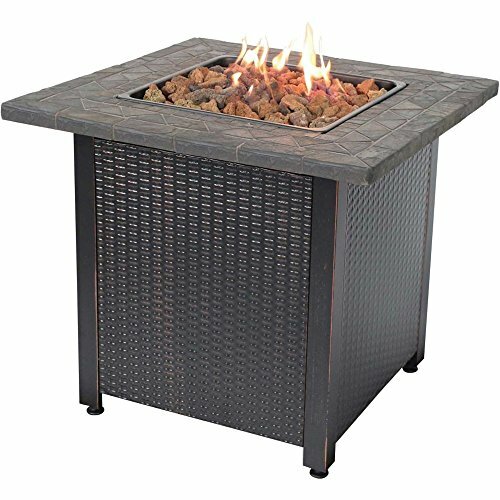 This unit also comes with a safety screen that will keep your kids and pets away from the open flame. 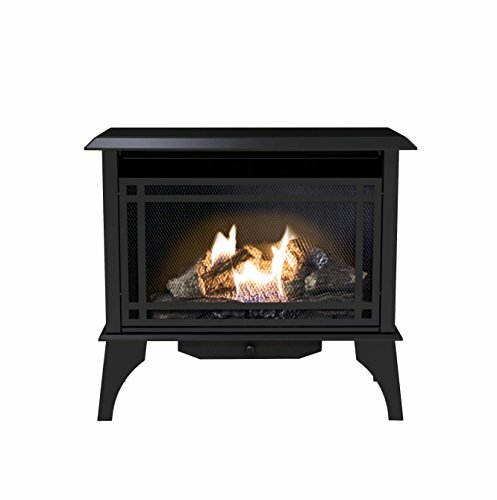 Can Ignite Without Electricity – This model comes with a manual ignition option, so you don’t need electricity to turn it on. Safe – This model uses several safety features that make it easy and safe to use. The Pleasant Hearth vent-free fireplace is a great option for those who are looking for a model that comes at a decent price. This unit might seem small, but it has a heat capacity of 30,000 BTU, which should be enough to warm up a space of up to 1,000 square feet. We were impressed by this model’s well-thought design. This stove comes with a minimal clearance design that makes it very easy to install. The unit is also easy to assemble and install. Last but not least, this model uses a flame that looks soothing and realistic. Noisy – The unit’s blower is noisy, so it can be bothersome at times. The Endless Summer outdoor fireplace is a great model for those who are looking for a way to stay warm in the chilly evenings of the late summer and early autumn. This model will produce enough heat to keep you comfortable as you spend some time outdoors. One of the things we liked about this model is that it comes with an easy-to-follow instructions manual. Most people will have the fireplace up and running in a matter of minutes. The initial ignition might take longer than you’d expect, but that’s just a safety feature. Another good thing about this model is that it really produces a good amount of heat. Bad Cover – This model comes with a cover that should protect it from the elements. Unfortunately, the cover is lightweight and it doesn’t do a great job of protecting the fireplace. The Mercury gas fireplace will make your living room warmer and more comfortable than ever before. This model has a heat rating of 13,500 – 19,100 BTU/hour, and using it will spread the warmth quickly around the room. Good Heating Capacity – Not only does this fireplace look good, but it’s also efficient. The fireplace can easily warm up your living room. Bad Fuel Utilization – This fireplace has an AFUE rating of 50.4%, which means that almost half of the fuel it uses is wasted. The Artisan 42” Linear fireplace is a spectacular model that will enhance the room you place it in. This is a vent-free model that has a contemporary design which will fit perfectly in every modern living room. The Artisan comes with a diamond and sapphire glass kit that will allow you to enjoy the fire while spreading the radiant warmth throughout the room. One of the things we liked about this model is that it’s very easy to use. The fireplace uses an electric ignition system that powers it in a matter of moments, and the touchscreen remote control has an intuitive design. The fireplace comes with a three-step flame adjustment, and you can dim the accent light according to your preferences. Finding the right gas fireplace might seem like a daunting task at times. There are many variables you have to take into account, such as the fireplace’s style, installation, heat output, and more. That’s why we decided to create a buying guide explaining how each of the fireplace’s features can influence its performance and your experience. Now, let’s take a quick look at some of the features you should look for in a gas fireplace. As you could see in our short reviews, there are more types of fireplaces you can choose from. Inserts are ingenious models that you can install in an old wooden fireplace. A great thing about inserts is that they don’t take up any space. In fact, the insert will use the same amount of space as your old fireplace, but it will be more efficient and it will produce more heat. However, you should spend some time measuring your old fireplace to make sure the insert will fit inside it. Otherwise, you might have to redesign your wall to fit the gas insert. Built-in models are the type of fireplaces people usually look for when they’re renovating or constructing their homes. These models are bulky and difficult to handle and install, but they offer great efficiency and good heating outputs. Built-in models look like inserts, but they come in a metallic box. The good thing about self-standing fireplaces is that they don’t need a hole in a wall for the installation. 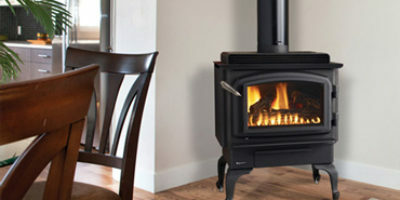 To use a self-standing fireplace, you need to assemble it and connect it to a natural gas or propane tank. 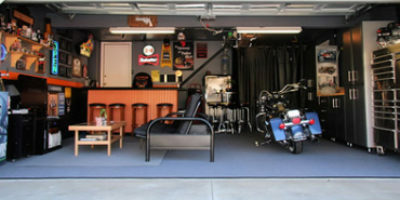 The whole installation process is usually easy and doesn’t take too long, so most people will have a self-standing model up and running in about an hour or so. A fireplace should be both pleasing to the eye and efficient. There’s no point in investing in a fireplace only for the ambiance it provides, the unit should also provide a lot of heat. Like all the other appliances that use gas as fuel, the fireplace’s output capacity is measured in BTUs/hour. Now, each fireplace can produce a maximum output and has a variable efficiency. The efficiency of a fireplace is measured by how much of the fuel it uses is actually transformed into heat, and how much of it is lost. So a unit producing 25,000 BTUs with an efficiency of 75% will be better than one that produces the same amount of heat with an efficiency of 50%. This feature allows you to adjust the flames’ power and heat output. The larger the flame, the higher the heat output and vice versa. This feature will also allow you to enjoy the flames’ dance during the warm season when you don’t really need the heat and only use the fireplace for the ambiance. Using a thermostat is the best way to make sure that your fireplace will maintain a constant temperature throughout the day. The thermostat will automatically adjust the power of the fireplace’s flames to control its heat output, so it will maintain the same temperature. This feature will make starting the fireplace easier, and it will also eliminate the need for a pilot light, making the fireplace more efficient. You can save up to $12 a month in fuel by using this feature. 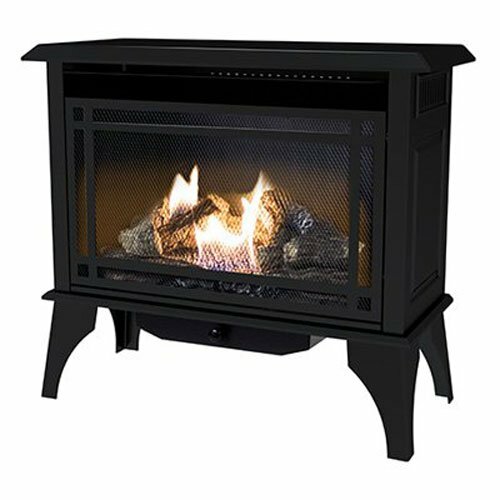 If you choose a fireplace with electronic ignition, it’s recommended to look for a model that comes with a battery backup. This will eliminate the possibility to find yourself without a heat source in the case of a power outage. Some fireplaces use LED lights to add realistic flickering effects to the flames. This feature will enhance the fireplace’s aspect and make the flames look more realistic. You should know that installing a fireplace will most likely require you to install a vent option as well. The venting is required to get rid of the pollutants produced by the fire. Unlike the fireplaces that burn wood, gas-fuelled models do not produce any smoke or smell. However, their flames still produce some pollutants that should be discharged outdoors. You can choose between installing a vented or a vent-free gas fireplace. The vented fireplace will discharge the pollutants outside your home. The vent-free fireplace does not have a vent option. Let’s take a look at the differences between these types of fireplaces. Directly vented fireplaces are relatively easy to install because they don’t need chimneys. Instead of a chimney, the fireplace uses one or two pipes to eliminate the pollutants. If a fireplace comes with two pipes, it will use one to draw air from outside and use it for the fireplace’s combustion. The second pipe is used to lead the pollutants outside your home. Vented fireplaces that use only one pipe draws the air it needs for the combustion from inside the room and eliminates the pollutants outside the house through the pipe. However, this system can work but it’s not very efficient. Vent-free fireplaces do not produce dangerous pollutants, so they don’t need a ventilation system. One of the benefits of using such a model is that you can install it anywhere you want as long as you can access the gas source. Since you don’t have to connect it to a vent, you don’t even need to place the fireplace next to a wall. These models draw the air they need for combustion from the room. They are usually more efficient than the other models, so all the heat they produce is spread throughout the room, instead of some being lost in the ventilation. Some models have an efficiency rating of 99%. What Is A Direct Vent Gas Fireplace Insert? 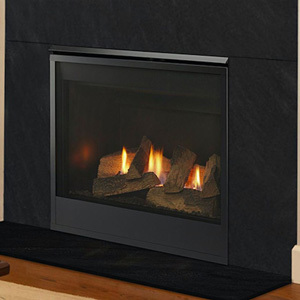 Direct vent gas fireplace inserts are some of the most popular models nowadays. Unlike traditional fireplaces, these models don’t need a chimney to work. Instead of a chimney, these models come with one or two pipes that lead outside. These pipes take all the gasses produced by the flames and eliminate them outside the house. Direct vent gas fireplaces are easy to install. They do not need chimneys, but they also don’t need any masonry or a foundation for the installation. You just have to choose an empty wall, connect the pipes to the exterior, connect the insert to the pipes, and you’re all set. The direct vent gas fireplaces have an easy operation mode. These units are connected to the exterior through one or two pipes. The models that use a single pipe draw air from the room to the combustion chamber where it needs it to fuel the flames and then it eliminates it through the pipe. The models that come with two pipes use one to draw air from the outside to the firebox and fuel the fire and then eliminate it through the other pipe. These models are more efficient than the ones that use a single pipe, and less of the heat they produce is wasted. Gas fireplaces offer many advantages over their wood-fueled counterparts. While it might be true that burning wood has its own beauty, they do have some drawbacks. They’re difficult to maintain, they are a fire risk, and they are expensive to install and use. On the other hand, gas fireplaces can offer the same ambiance effects with less maintenance and low operating costs. Let’s see how they compare with wooden fireplaces. Gas fireplaces have easy installation. If you have an existing fireplace, you can install a natural vented model in its place with a minimal effort. This will allow you to use the same location for the fireplace without all the hustle of cutting wood and burning it. 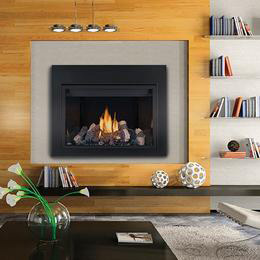 Directly vented fireplaces can be installed in a matter of hours. They only need connections to one or two pipes and they’re good to go. As for vent-free models, they’re really easy to install. In fact, the whole installation process consists of connecting the fireplace to a natural gas or propane source. Wooden fireplaces are fire and smoke hazards, so most people will avoid installing them in their bedrooms. But gas fireplaces are very safe to use, and since they don’t require much in terms of installation, you can place them anywhere you want. Whether you want to install the fireplace in your living room, bedroom, or even on your patio, it’s possible with such a model. Gas is a far more reliable fuel source than wood. When you use a wooden fireplace, you have to make sure that your wood supplies are dry and split so they would fit in the firebox. Gas, on the other hand, is easy to come by. Whether you use a propane tank or a direct line to the municipal natural gas supply, you can bring it easily to your home. Whenever you use a wooden fireplace, you have to kindle and light the fire. Using gasoline or other substances to ignite the fire can produce an unpleasant smell in your entire home, so the ignition process can be lengthy at times. Gas fireplaces can be started with a push of a button. Moreover, you can control everything through a remote, from the fireboxes’ backlight to the flames’ height and heat output. A fireplace that relies on wood as fuel will only produce heat as long as it has wood to burn. If the wood is mostly burnt, the fireplace’s heat output will drop considerably. This doesn’t happen when you use a gas fireplace. These models come with a thermostat, so they will adjust their heat output to maintain a constant temperature in your home. You don’t have to worry about cleaning the ashes when you’re using a gas fireplace. You can start the fire with a press of a button, and you can stop with by pushing a button as well. Moreover, these units don’t produce pollutants that will stick to the inside of your chimney, so you won’t have to clean it as often. Since they don’t need a foundation or even a mantel, let alone a chimney, gas fireplaces are considerable cheaper than wooden ones. And installing them is cheaper as well. Most professionals will install a gas fireplace in a matter of hours, so they will not charge you too much. You can even install some models by yourself, lowering the installation costs even further. Gas fireplaces are more energy efficient heaters than wooden ones. A fireplace that uses wood as a fuel usually has a heat output of up to 30%, which means that up to 70% of the fuel is wasted. On the other hand, gas fireplaces have a heat output of 70% or more. Some models can even reach 99%. If you’re looking for the best gas fireplace in your home, you should start by measuring the ideal location for it to make sure it will fit. 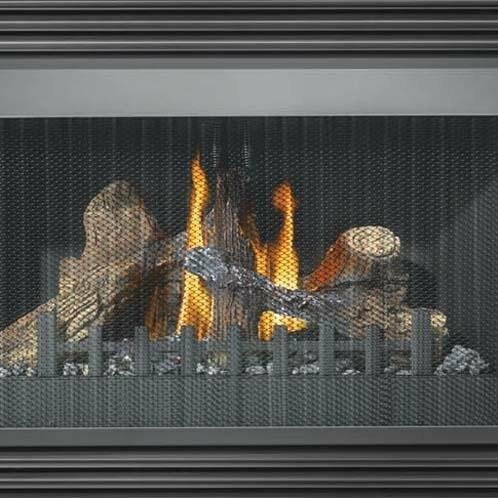 As you could see in our gas fireplace insert reviews, every model has its own design and dimensions. Some models have to be placed next to a wall, while others can be placed in the middle of the room, or even outside. If you want to use a fireplace to warm up your entire home, the best approach would be to determine where to place the unit so it will spread the warmth evenly throughout the house. Once you install a gas fireplace, you’ll have no problems using it. These models are easy to use, and most come with intuitive remote controls that give you the opportunity to change all of their settings without getting off the couch.